Indentification of this design as number 122 is original to Rakusan who designated this woodblock print as the 122nd design published in his main sequence. However, 122 is actually the twenty-second of thirty-six woodblock prints in Rakusan's second main sequence series, 篁子生画選, Koushisei Gasen, lit. 'Koushisei's Print Selection' (usually called here the 36 Series). The woodblock print of 122 was adapted from an actual-size original painting on silk. All of the original prototype paintings for this series are currently in a single private collection. Like most 36 Series designs 122 has the same signature and seal combination on every copy. Therefore, for 122 only a single extended edition I (which potentially includes reprintings both before and after World War II) can be distinguished. It is usually only possible to date an individual loose print of 122 with edition I markings by listing approximate potential ranges of 1934-1941 and 1948-1955. The copy illustrated above is typical of edition I (except for a city-name stamp added later in the lower right corner). The Rakusan project which produced 篁子生画選, Koushisei Gasen, resulted in two related series of woodblock prints. Each print of the 36 Series is intimately connected to a group of prints with the same subjects in the separately distributed Fan Series. Together each set of subject-related prints from the two series constitutes a theme. Each theme typically consists of a quintet of monochrome Fan Series designs (one design in each of the five different fan shapes), plus one polychrome 36 Series design which defines the theme subject. The theme is labeled here by the original Rakusan number of its 36 Series design followed by the subject. 122 is the 36 Series design of the 122 Wild Plum theme. The 122 Wild Plum theme is one of three different themes based on flowering plums. (The other two are 123 Red Plum and 124 Bonsai Plum.) Because the Fan Series prints for all three of these themes were delivered as a single installment, it has proven very difficult to assign the individual, loose, flowering plum designs to their appropriate themes. 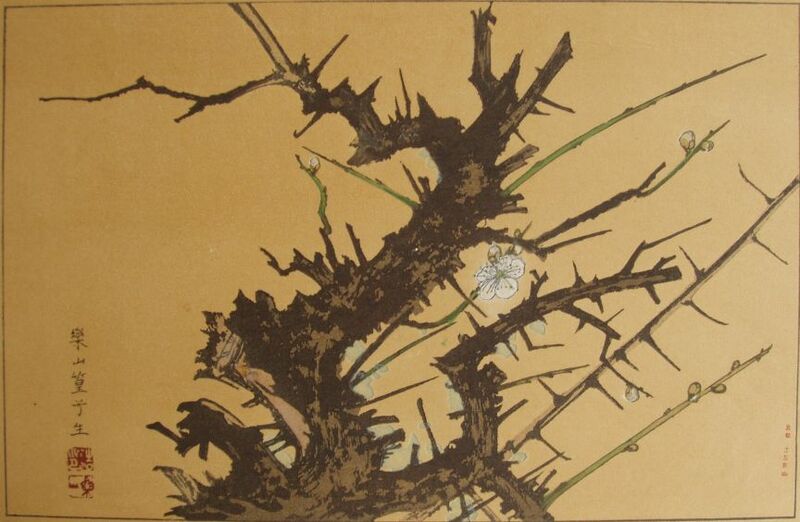 In monochrome prints the color of plum blossoms is uncertain, and of course a bonsai plum can be any color. However, there are exactly three designs of each fan shape, and there is no evidence that the installment consists of anything other than three entirely regular themes each with a complete Fan Series quintet. The publication of the flowering plum Fan Series installment is very well documented. The delivery documents for installment seven in October 1934 list the three plum themes in a preview announcement for the installment due the following month. Those for installment eight confirm that the Fan Series woodblock prints for all three plum themes were printed during November 1934 and were distributed November 22, 1934 as installment eight (of twelve). Rakusan used the same three theme titles on both sets of delivery documents: 野梅, ya-bai, 'wild plum'; 紅梅, kou-bai, 'red plum'; and 盆梅, bon-bai, 'bonsai plum'. These are also the titles of their corresponding 36 Series designs published at the same time. The theme assignment issues and the signature and seal markings of the flowering plum designs suggest that their Fan Series prints are best considered together as a single unit of fifteen designs. Fully thirteen of the fifteen Fan Series designs have seal C which indicates carving dates between the last months of 1933 and the end of the first quarter of 1934. The other two Fan Series designs have rare minor seals, one example each of seal Q and of seal R. They may possibly date from the seal A period around the third quarter of 1933, however assignment to the seal C period (which would make all of the flowering plum Fan Series designs contemporaneous) cannot be ruled out. The 36 Series bonsai plum design, 124, is the sole woodblock print example of minor seal D whose carving period is assigned to the seal C period. After preparing the wooden blocks for these relatively early designs, Rakusan set them aside for several months. The remaining two 36 Series flowering plum designs, 122 and 123, have seal B which indicates they were not carved until somewhat later, and perhaps only shortly before their publication. Rakusan was aware of the problem of recognizing the theme assignments for the individual flowering plum Fan Series designs. He decided to label the first Fan Series print of two of the three themes with a theme title incorporated into the design. Because Rakusan put these exceptional titles on designs of the same fan shape, that shape was defined here as fan shape 1 for the entire series. Corresponding to 36 Series design 122 is Fan Series design 122-1 which incorporates the title 野梅之圖, ya-bai no zu, Wild Plum Pictures, [之圖 would now be written の図]. Rakusan was otherwise relying only on his original distribution arrangement to keep the themes separate. He would have arranged the prints so that the subscriber received each of the three theme sets in the proper order with each of the first two themes beginning with a fan shape 1 design with a title. (The third set has no title on its fan shape 1 design.) Unfortunately, since the prints were delivered loose, and were thus easily rearranged, that original delivery order has not been reliably preserved in any surviving collection.